With Onvif IP Camera Viewer, you have the opportunity to access USB, Real Time Streaming Protocol (RTSP) and Onvif IP cameras. You are free to develop camera viewer applications that are capable of detecting motion, query and set image settings, use Pan-Tilt-Zoom (PTZ) control over the camera, create server mode to stream IP camera video to the connected clients, implement Voice Over IP (VoIP) Session Initiation Protocol (SIP) alarm call and more. Only NuGet is essential to start developing your very own applications. This guide helps you to start and to build your camera project efficiently. What is NuGet and why is it useful? NuGet is a free, easy to use and open source package manager for the .NET Framework and it is distributed as a Visual Studio extension. The NuGet client tools provide the ability to produce and consume packages. It has a central package repository which can be used by all the package authors and consumers. So if you use the NuGet package manager you will be able to get the latest version of the package what is important to you. With Installing the NuGet Package Manager, you can download and easily update the project (Camera SDK and the corresponding sample program). The NuGet is available for Visual Studio 2010, 2012 and 2013. An extension can be installed to the Professional, Premium, and Ultimate editions. First of all select the 'Tools' menu and 'Extension Manager.' (or Extensions and Updates...). In Extension Manager select Online Gallery, and click to the 'Search Online Gallery' field in the upper right corner. Then type in the NuGet word. After finding the 'NuGet Package Manager' extension, click to the 'Download' button next to it, and follow the installation steps (Figure 1). The NuGet is included in every edition (except Team Foundation Server) by default. 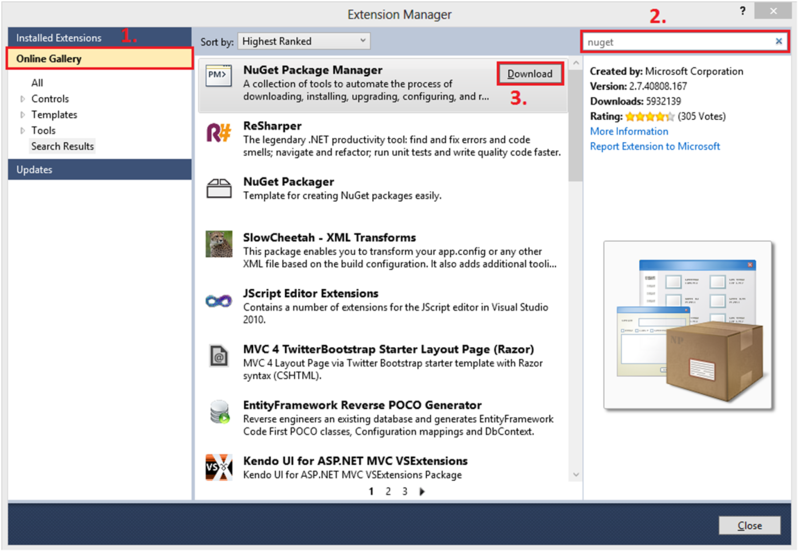 Updates of NuGet can be found through the Extension Manager. You can check whether your copy of Visual Studio already has the NuGet extension, look for Library Package Manager in the Tools menu of Visual Studio. If your copy of Visual Studio does not have the Library Package Manager (NuGet) extension yet, you can install it by using the Extension Manager. After you have installed the NuGet Package Manager, you can download the project by Package Manager Console. Select the 'Tools' menu -> 'Library Package Manager' (or NuGet Package Manager) -> 'Package Manager Console' (Figure 2). In the Solution Explorer, you can see the added new Camera SDK Reference, and the added class files (Program.cs, Form1.cs, Form1.Designer.cs). You have downloaded, and installed the project. For managing Onvifcamera connection you can check the files of the Onvif.IP.Camera.Viewer. In the Program.cs the Main method is a standard Windows Form Main with default settings and running of the GUI. In the constructor of the Form1.cs there is a InitializeComponent() method call for initializing the GUI components of the source code like the connect button (connectBtn) and video display panel (panel1). In the other lines of this constructor there is an initialization of a VideoViewerWF, the setting of the connection between the panel and the video viewer and the setting of the image provider. There is a click event of the connect button which is responsible for creating the connection between the application and the camera. The source code includes an IIPCamera object called _camera and we need to equal this to the return value of the IPCameraFactory.GetCamera(). We need to connect the video channel of the camera to the image provider then we can start the camera and the video viewer. Finally there is the Form1 designer code which is respnsible for managing the GUI elements and their events.